WASHINGTON—In his State of the Union speech, President Donald Trump called for bipartisan support to rebuild America’s “crumbling” infrastructure. While a plan to modernize infrastructure appeals to both sides of the political aisle, there is the question of how to pay for the president’s $1.5 trillion overhaul plan. Trump asked federal funds to be “leveraged by partnering with state and local governments,” as well as turning to the private sector for funding, where appropriate. While the details of the plan are unclear, Republicans are exploring various financing options to fix the country’s ailing roads, bridges, airports, railways, and water systems. 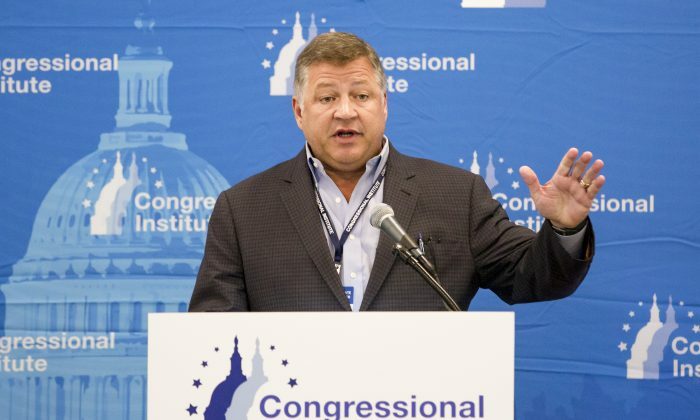 “One of the interesting concepts we have been exploring is what the Australians have done with asset recycling,” said Rep. Bill Shuster (R-Pa.), chairman of the House Transportation Committee, after a strategy session at the Republican retreat in West Virginia on Feb. 1. Asset recycling is a funding mechanism that was first used in Australia. It involves leasing or selling off publicly owned infrastructure to private partnerships and using the proceeds to fund new projects. It is an effective way to release the value of an existing asset and recycle it into much-needed infrastructure, according to experts. Shuster claims that asset recycling is also advantageous for the government as it creates additional tax revenue. According to a Fox Business report, the Trump administration is seeking advice from Joe Hockey, the Australian ambassador to the United States, on the permitting process and public-private partnerships. The United States is still underutilizing public-private partnerships that are widely used in other countries, according to the business community. “Australia is way down the road. Canada is way down the road. Europe is way down the road,” Glenn Youngkin, co-CEO of the Carlyle Group, said at America’s Infrastructure Summit on Jan. 18. Even emerging market economies, he said, are embracing public-private partnerships in a very aggressive way. However, there is a risk to capital formation in the United States because of a “great amount of doubt” over infrastructure projects, he added. “We must compete. We not only must compete with the infrastructure that we develop but we actually have to compete for capital,” Youngkin said. The business community is confident that enormous private capital could be mobilized for U.S. infrastructure investments, as they are attractive asset classes given their long-term and predictable nature. For some Republicans, increasing the federal gas tax remains an option to raise revenue for roads and bridges. Shuster said he brought up the idea of raising the gas tax during the meeting at the conference. These assets that are owned by municipalities and states don’t pay taxes. When a private company comes in to run it, they start to pay local, state, and federal taxes. “We need to deal with the shortfall in the Highway Trust Fund (HTF). It is projected to run out of money in October 2020,” he said. “Nobody wants to raise taxes, nobody wants to raise fees in this country,” he said. He reminded that since 2012, 31 states have hiked their fuel taxes to fund the costs of road construction and maintenance, and 19 of those states were Republican-governed. Not a single lawmaker in his state of Pennsylvania lost a seat, however, for raising the gas tax, he said. “Because American people understand that we need to invest in our infrastructure,” he said, adding that 100 percent of the Highway Trust Fund goes into the system to rebuild, maintain, and expand the infrastructure. Shuster will not seek reelection in November. According to a report by the Washington Examiner, he will spend most of his time before his retirement focusing exclusively on working with the president and Congress to pass an infrastructure bill this year. Trump’s position on raising the gas tax is not clear. According to a Jan. 10 Washington Post article, Trump privately proposed “massively increasing” the gas tax but Republican leaders in Congress refused the idea. “I have complete confidence that we will not be raising the gas tax,” said Sen. John Cornyn (R-Texas), according to the same report. Congress hasn’t raised the federal gas tax in 25 years. The current federal fuel tax is 18.4 cents per gallon for gasoline and 24.4 cents per gallon for diesel fuel. And it is not indexed to inflation. Fuel taxes mostly go into the HTF, with a very small portion financing the Leaking Underground Storage Tank Trust Fund. 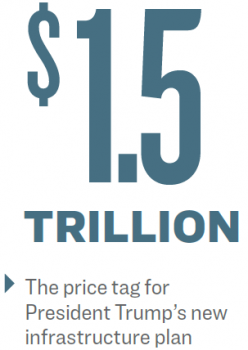 “Increasing the fee by a total of 25 cents, indexed for inflation and improving fuel economy, would raise $394 billion over the next 10 years,” said Thomas Donohue, president and CEO of U.S. Chamber of Commerce at America’s Infrastructure Summit on Jan. 18. The increase in the fee would cost the average driver about $9 a month, versus nearly $40 per month in higher maintenance costs resulting from deteriorating roads, he said.